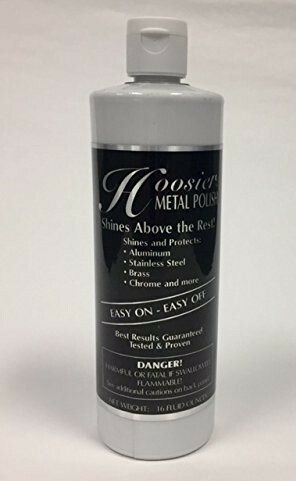 Hoosier Metal Polish is easy to use. Shake bottle thoroughly before and during application. Put a small amount on a clean cloth and apply to a clean surface. Wipe clear; no need to wait. For better and faster results use a power buffer. Hoosier Metal Polish will keep your metal shining for 10-12 washings depending on the harshness of your water and soap. After the initial application, you will notice Hoosier Metal Polish becoming easier to use. Lightly acid deteriorating metal surfaces before polishing to obtain best results. If a slight residue on surface, sprinkle flour on cloth and wipe clear. Lightly buff clear coated wheels to clean and polish.